Location o the Scattered islands in the Indian Ocean. 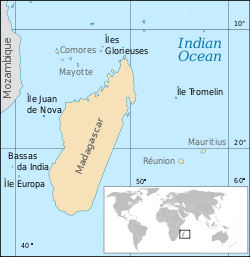 Tromelin Island (French: Île Tromelin, pronounced [il tʁɔmlɛ̃]) is a law, flat, uninhabitit island in the Indian Ocean, aboot 450 kilometres (280 mi) east o Madagascar. This page wis last eeditit on 19 Juin 2016, at 16:28.